“After receiving a possible cancer diagnosis, my doctor told me that I needed to have surgery. I was scared and distraught. I was easily angered at work, and on the verge of tears all the time. I thought yoga might help, but I was worried that I would break into tears during class. I emailed Lynne about private sessions. During our consultation, it became evident that my best option was to sign-up for a six month coaching package. I am so glad that I did! In the weeks before my surgery, Lynne helped calm me down and envision a positive outcome. She led me through guided meditations, which were wonderful. I had never meditated before; it was a great experience. I was able to work without getting angry or crying. I went into surgery feeling more calm than either my husband or sister. I truly felt confident that I would be able to face any outcome! Fortunately, the cyst was not cancerous. In Lynne, I found a skilled and empathic practitioner who offer an integrated, systemic and holistic approach to health and wellness. She worked seamlessly with my personality putting me immediately and completely at ease. We laughed often, and I thoroughly enjoyed the coaching sessions. Lynne is an overflowing font of information and addressed my main areas of concern: diet and sleep. The improvement in my health in only two months was dramatic. I decreased my insulin use by half and eliminated the OTC sleep aid I’d used for 5 years. 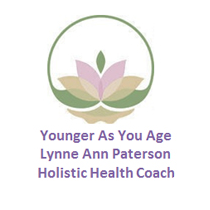 I highly recommend Lynne to anyone who seeks to feel better and live well. THANK YOU for being here, doing the awesome work that you do! It is a really important part of my life. I am so to grateful you. I continue to work on bringing my body, mind and soul into some kind of clear working and constantly changing understanding and relationship. Sometimes so light, sometimes hard to bear! Wow! Thank you, thank you, thank you!! Working with Lynne has radically changed my understanding of food and nourishment for myself and for our planet. Personally, I feel calmer. My mind is able to slow down and process the bumps in my day. I’m finally able to determine when I’m hungry vs. when I eat because my mind desires something. I’m definitely a work in progress and know that it will take “practice” to integrate this knowledge fully. I plan to continue taking Lynne’s classes. I’m so grateful. After my accident, I was in so much pain, but you seemed to know exactly what I needed – not too much, not too little. Working with you was the first step back to normalcy and hope; you got me on the road to health. My back pain went away completely. I am very grateful. It was more than fabulous working with you – it was a miracle! I am finding the information that you gave me to be really valuable. I’ve already seen big changes in my digestion. The water every morning before food has not only helped me poop like clockwork, but I can feel how much my body likes it! I like the pace of taking time for myself each morning; my organs feel as though they are getting pumped up and ready for the day. Honestly, you came in the nick of time! I used the cold busting tonic & the decongesting tea recipes this week at the onset of a bad cold. I can honestly tell you they have made such a difference! It’s like magic!! I feel so much better. Thank you for sharing your knowledge. Sign Up for a complimentary consultation and get lasting results.